*** My apologies, but this giveaway had to close early due to sponsor requirements. Timothy Keller is one of my favorite authors. The pastor of the church I attended where I last lived quoted him often. I was very eager to read "Prayer" by Timothy Keller and I'm so glad that I did. Prayer is one of those things I struggle with, for several reasons, and Timothy Keller actually addressed them all in his book! I don't struggle with making the time to pray, because I do that several times a day. But I do struggle with whether I'm praying the right way, whether I'm praying for the right things, and whether I'm approaching prayer with God Almighty, creator of the entire universe, correctly. Prayer can be intimidating, which is why many people may avoid the regular practice of it, at least until something horrible is happening in their lives. Timothy Keller's book "Prayer" is not a book you can read in one sitting. It's filled with tons of information that needs to be digested slowly. I took almost two weeks to read it, in short bursts, so I could mull over what he had to say. The book is divided into five parts, Desiring Prayer, Understanding Prayer, Learning Prayer, Deepening Prayer, and Doing Prayer. Within each book part, there are several chapters, so it was easy to read just a section at a time. In his book, Keller refers often to some of the past theologians who studied prayer in depth, including St. Augustine, John Owen, John Calvin, Martin Luther, and of course, Jesus, the master of prayer. I loved Keller's incredibly deep study of The Lord's Prayer. Since this is a prayer I say daily, it was enlightening for me to see even more clearly the intentions and implications of it. Since it is how Jesus taught us to pray, Keller shows us the emphasis is on "how" to pray, rather than "what" to pray. I know The Lord's Prayer by heart, but Keller defines knowing something "by heart" means to know WITH my heart, not just to have the ability to recall the words. He breaks down each line of The Lord's Prayer into a model that can be used to know God more intimately. I highly recommend Timothy Keller's "Prayer." In fact, I recommend ALL his books. 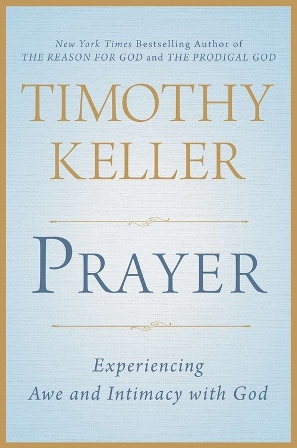 "Prayer" aims to help you "experience awe and intimacy with God" and Keller's biblical guidance is an excellent resource for deepening a connection with God. Buy this book at FamilyChristian.com! Win a copy of Timothy Keller's "Prayer"
To enter, just fill in the giveaway form below. Giveaway is open to US readers, ages 18 and older. Giveaway ends on 3/6/2016. Good luck! I need prayer for direction. My husband is retiring and wanting to move while I want to stay close to our children and grandchild (and future grandchildren). I will be praying for you Deborah! My prayer request is this. I love Jesus with all my heart. Although, some days I don't feel His presence as much as I would like. Could you please pray that I can open my heart even more and give my all to The Lord? Thanks so much! Yes, absolutely, Edye! I will be praying for you. I will be praying for your husband's success! For health and happiness!! I have been struggling with both lately! I will pray you find both, Amber! The company my husband works for got bought out and uncertainy is rough sometimes :) Thanks for your prayers! I will be praying for job security, Heidi! Please pray that my baby girl (who is an adult woman) will deliver her newest baby safe and sound and that the baby will be healthy. I am praying for your family, Terri! My son is 18 and has had 39 fractures and has scoliosis. He will be having back surgery to put 2 rods in his back with clamps to help hold them in place but they are having trouble because his bones are too weak to hold them. His name is Andrew. Oh my goodness! I am praying for Andrew! I am always praying for my husband's health to maintain a good quality. I am praying for him too, Judy!